Loss of Cdk2 inhibitory phosphorylation results in DNA damage. Control (+/+) and Cdk2AF (AF/AF) cells were treated with hydroxyurea (HU) to perturb DNA replication. 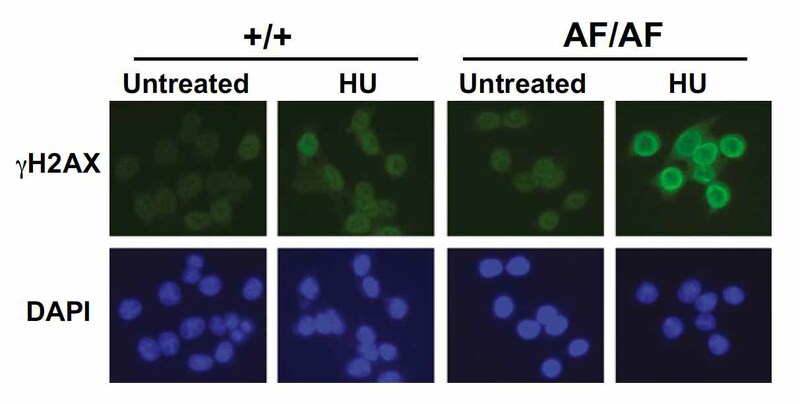 Staining with an antibody against gamma-H2AX, a marker of DNA damage, reveals prominent DNA damage in AF/AF cells that have lost proper control of Cdk2 activity. The controlled entry of cells into and through cell cycle stages is important to keep cellular proliferation in check. The two main cyclin-dependent kinases (Cdks), Cdk1 and Cdk2, phosphorylate their targets to fuel cell cycle events. Cdk1 activity peaks and is required for the initiation and completion of mitosis, whereas Cdk2 is essential for the G1/S transition and during S-phase. Uncontrolled Cdk activity can increase the risk of tumorigenesis, and enhanced Cdk activity occurs in a range of tumor cells. In a new manuscript published by the Clurman Lab in the Human Biology Division, lead author and postdoctoral fellow Dr. Bridget Hughes and colleagues deciphered the role that tight control of Cdk2 activity plays on cell cycle events. Although the outcome of inhibitory phosphorylation of Cdk1 on mitotic events has been well studied, Hughes et al. now provide a clear picture of the drastic consequences that uninhibited Cdk2 activity has on S-phase events. Cdk2 activity is inhibited by phosphorylation at two adjacent amino acids in Cdk2: T14 and Y15. The Wee1 kinase phosphorylates these sites of Cdk2 in vivo, and previous studies inhibited Wee1 activity to block Cdk2 phosphorylation to monitor the effects on DNA replication and DNA damage checkpoints. However, loss of Wee1 activity could alter other proteins in addition to Cdk2 activity, making this method less specific. As an alternative and more direct approach, Hughes et al. generated a human cell line in which the Cdk2 gene was replaced with the Cdk2AF allele, to produce an abnormally active protein that could not be phosphorylated at T14 or Y15. The authors discovered that Cdk2AF/AF cells entered S phase prematurely and had elevated Cdk2 kinase activity when released from a quiescent state. However, these cells had normal asynchronous cell cycle profiles. Since it has been shown that inappropriate activation of Cdk2 is monitored by a p53-dependent pathway, the researchers wondered whether p53 activation in Cdk2AF/AF cells was masking cell cycle defects in Cdk2AF/AF cells. p53 induces the expression of the p21 Cdk inhibitor to down-regulate Cdk activity, and the researchers found that p21 levels were increased in Cdk2AF/AF cells and inhibited Cdk2AF activity. Indeed, the genetic instability in Cdk2AF/AF cells (as evidenced by micronuclei formation) was exacerbated by p21 knockdown. These initial results by Hughes and colleagues suggest that Cdk2 inhibitory phosphorylation is required to prevent genomic instability in proliferating cells. Additional experiments revealed key roles that Cdk2 inhibitory phosphorylation has on controlling DNA replication. To analyze changes in the cellular recovery from replication stress, Cdk2AF/AF and control cells were briefly treated with hydroxyurea and cell cycle profiles were monitored after drug washout. Strikingly, Cdk2AF/AF cells failed to exit S phase and displayed markers of senescence. As expected, the phenotypes were due to increased Cdk2 activity in Cdk2AF/AF cells since Cdk2 siRNA, or addition of a drug inhibitor of Cdk2 activity prior to hydroxyurea treatment, rescued cell cycle progression. As hydroxyurea treatment stalls DNA replication forks and increases the likelihood of DNA damage, the authors speculated that Cdk2AF/AF cells had acquired DNA damage during the drug treatment. Indeed, the researchers found strong and persistent staining of H2AX, a marker of DNA damage and DNA double-strand breaks, in Cdk2AF/AF cells (see figure). These results confirmed that Cdk2 inhibitory phosphorylation protects cells from accumulating irreparable DNA damage and undergoing senescence during replication stress. Lastly, Hughes and colleagues wanted to assess the role that Cdk2 inhibition plays on initiation and elongation of DNA replication. They found that asynchronously growing Cdk2AF/AF cells had increased replication origin firing and decreased fork speed, a measure of elongation. Also, hydroxyurea-arrested Cdk2AF/AF cells replicated more DNA during the arrest compared to control cells, indicating that the inhibition of Cdk2 activity by phosphorylation is required for a normal S-phase checkpoint response. Hughes BT, Sidorova J, Swanger J, Monnat RJ Jr, Clurman BE. 2013. Essential role for Cdk2 inhibitory phosphorylation during replication stress revealed by a human Cdk2 knockin mutation. PNAS 110(22):8954-9.